After a summer running in the “football” stadiums of Europe, it is back to work in the football stadiums of America. The seasons have changed and I begin the 2016 NFL season tonight with a Super Bowl rematch of the Denver Broncos and the Carolina Panthers. It will be good to start my 31st regular season as spotter with Al Michaels and the NBC crew. Also good are the changes that are taking place in the lives of Tim Burr and Mackenzie Langley who have been inspirations to me this past summer as we ran the race2walk2016 events in Europe. Tim, who wrote about his experiences walking in the Ekso-Skeleton here, is off for his freshman year at Colorado St.. And“Mac” as the family calls Mackenzie, left this week to attend Denver University for her freshman year as well. These are remarkable achievements for any young person, but especially for those who are doing so in wheelchairs. Kudos to the kids. They are the best. Over the next few months I will be getting ready for the final four events, the 400m, the 10000m, the half marathon and the marathon, which I’ll run in the spring. But we also will be doubling down on our efforts to raise funds for the exo-skeleton. You’ll be hearing more about that. In the meantime, start saving your shekels. I’ll be asking for donations to race2walk2016.com soon. Al Michaels is host of television's top rated program, NBC's "Sunday Night Football"
A week back (as opposed to a weak back), and I have been inspired on multiple fronts for the next phase of The Running Decathlon. Most especially by my visit to the Bridging Bionics Foundation facility at the Snowmass Club. There, both Win Charles and Mackenzie Langley climbed into “Tucker,” the Ekso Skeleton, and walked across the length and width of the well-appointed facilities of the club. Both showed such joy as they first used the vibrating Galileo Tilt table to stimulate their legs, and then stood tall and strutted across the room in Tucker. There were smiles all around. It is so gratifying to see people take such pleasure from taking a stroll, even if it is a physically difficult thing to do. MACKENZIE LANGLEY TAKES A STROLL AT THE SNOWMASS CLUB IN HER BIONIC EKSO SKELETON. When I am on a run and feel a little stress or discomfort, I can simply think of these guys and get a burst of perspective. It may sound trite, but they are definitely in my mind when I am trying to run my races and in my training as well. And then there has been the Olympics. The week started with world records in the Women’s 10000m and the Men’s 400m. I did not see that coming. But watching Usain Bolt’s 100m win, and especially Crested Butte’s Emma Coburn’s Bronze Medal finish in the 3000m Steeplechase, has been truly inspiring as well. I especially loved watching Emma in her interview with my Sunday Night Football buddy, Al Michaels, when she told him, “You are like a God to me, you are like a hero. I am so star struck right now.” Turns out Emma was a fan of Al’s thanks to his “Do You Believe In Miracles” call during the 1980 Olympics – more than ten years before she was born. THE EMMA AND AL SHOW ON NBC. Usain runs again in the 200m semi-finals tonight and the finals tomorrow night. Hope he runs under :19. My half-as-fast time will still be intact. All Hail Wayde van Niekerk, new World Record Holder in the 400m. Before tonight, just one American runner held a world record in any of the ten events in The Running Decathlon. Michael Johnson ran a 43.18 400m in Seville, Spain, in the World Championships in 1999. And before tonight, all ten of the world records had been set in Europe. That all changed as Wayde van Niekerk of South Africa set the world record in the 400m, with a 43.03 run in the finals of the Rio Olympic Games. He broke Johnson’s mark by .15 seconds and became just the second man, along with David Rudisha (800m), to currently hold a world record in The Running Decathlon event that was set on the grand stage of the Olympic Games. It was an epic performance and, also, all hail to his 74-year-old coach, Ans Botha. It was meant to be. So now the quest for The Running Decathlon, running the top ten races half as fast as the world records in each, takes a turn. Ans Botha, Wade van Niekerk's 74-year-old coach, helps him with the starting blocks. So excited for the opening day of track and field at the Rio Olympics, and the first final saw an amazing, incredible, spectacular performance in the women’s 10000m, where Almaz Ayana of Ethiopia crushed the standing world record by more than :14. (Matt Slocum / Associated Press) Almaz Ayana of Ethiopia crushed the standing world record by more than :14. I can feel your joy sister Ayana. After crushing all six of my goal times in the first six events of The Running Decathlon, each in times that exceeded my expectations, I felt humbled by the speed of those who actually set the original world records. Over the next few days, we will be able to watch world record holders Usain Bolt (the 100m and the 200m) and David Rudisha (the 800m) compete on what looks to be an extremely fast track. Bolt’s 100m final will be on Sunday night and the 200m final is on Thursday. For Rudisha, the 800m final is on Monday night. It is interesting to note that just one of the men’s World Records in the eight running events that I have included in The Running Decathlon was actually set in Olympic Competition. That would be Rudisha’s time of 1:40.91 set four years ago in the London Games. It will be interesting to see if any of the other world records will be broken in Rio. For perspective, I have compiled this list of the times I ran in The Running Decathlon and the Olympic Record in each of the events. As you can see, in the six events already completed I am faster than half as fast. My clock. The Hengelo clock after the 5000m. 10,000 miles on the road without a hitch, and ppfffttt, a nail in a tire strands us in our driveway as we set off to pick up Vino from Ted Hoff's home for wayward dogs. Sigh. Likely means another night without the big guy, and sheesh, is it quiet here without him. In the meantime, lots to do. Regroup with the A Team here, Amanda and Nancy, who have supported us on our amazing journey (6 for 6 on the first of 10 runs for Kelly on race2walk2016), and get a plan for fundraising going. If you are reading this, make not only my day, but the day for all the folks and clients of the Bridging Bionics Foundation, by making a donation to help us purchase an exoskeleton. Just go to race2walk2016.com and hit the donate button. We’ll all get moving soon. 35 Days, 4 countries, 17 hotels, countless planes, trains, and cars and just under six miles of runs, and she was there, each and every step of the way. My wife, my life, my love, Linda has made all the difference in this incredible adventure. There are no words to describe how wonderful she has been over, not just the last month, but over the last forty years since we first laid eyes on each other in the summer of America’s Bicentennial. From the first hatch of this fledgling plan she was supportive, though a bit concerned about the time and money that would be involved. Still, she said, ‘This is so you,” and it was she who made the first booking, a splendid B&B in Amsterdam while we laid in bed in Aspen on a rainy Sunday morning in May. Once that ressie was made, by telephone with the Dutch proprietors, of course, we were off to the races, so to speak. And it has not just been her presence at the races and at the tracks that has stirred me. She has been at my side in every vineyard, at each tasting and in each session with the winemakers of Italy. Do you have any idea of how many dusty and cold barrel rooms she has had to withstand while I quizzed a winemaker about whether punch down or pump over is the better way? Or how many times she has heard, “And we pick everything by hand.” But her appearance beside me lends a degree of credibility at each visit we make to the wineries. People see her and the mood immediately changes. It may be business, but when Linda is in the room the vibe turns to pleasure for all. She also was there to read every word and make every edit, and believe me there were plenty, when I wrote the blogs and the stories at night after our long days of travel. Mistakes in this piece will likely be many as she was not privy to the contents. In fact, she would be mortified if she knew I was writing it. All of you who know her know what an amazing person my wife is. But travelling through this journey with her has only confirmed what I have known for 40 years. In front of her castle. THE SIXTH RACE (ON THE 7th DAY OF THE 8th MONTH OF 2016). Sunday dawned this morning on Iffley Road in Oxford, England, with clouds, wind and a touch of rain. It was similar to the May day in 1954 when Roger Bannister and his pacers, Chris Brasher and Chris Chataway, took to the track just down the street from where I was staying at Stephens House with a goal of guiding Roger to the first sub-minute mile in history. My hamstring was hamstrung, and just getting my shoes on to run the last race my trip, the 800 meters on the Roger Bannister Track, was difficult. I was pretty sure that I would be able to get through the race, but was seriously concerned that I would not be able to make the pace of 3:20 that I needed to be half-as-fast as David Rudisha’s mark of 1:40.9, set four years ago in the 2012 London Olympic Games. The leg injury was not serious, but at that time in the morning, felt significant enough to deter my final goal. Getting things together, I opened up the Sunday Times of London and serendipitously turned to a feature and photo of Rudisha, who is attempting to become the first man in 50 years, since Peter Snell, to complete an Olympic Double Gold in the 800m. It was inspiring. But not as inspiring as the “Spinal Column” article in the same paper, written by Melanie Reid, who had become a tetraplegic in a riding accident in 2010. The well-penned piece detailed how she "keep(s) going for the people who love me.” It seemed to be a sign. Still, I was glad there was little fanfare for this one. The injury, and the fact that I had foreseen this run to be the most difficult challenge yet, had me thinking about how and where I could re-run the race after I failed to achieve my goal in this attempt. Arriving on the grounds of the iconic Roger Bannister Stadium. I had sent out a request to the Oxford Athletic Club to see if someone would like to pace me, and I received a response from a Helene Greenwood, who said she would like to help and would be at the Bannister Track that morning. As I walked through the grounds on the way to the track, I saw a young lady trotting around the far stretch. It was Helene, a 19 year-old chemistry student at Oxford, and a member of both the Track team and the Cross Country team at the University. On the final lap, I thought of the laps I had run before on this trip. The mile and 1500m in Rome, the 12-and-a-half laps in Hengelo, and, of course, the sprints, the 100m and the 200m in Berlin. Six races and less than 6 miles total. The finish of the 800 meters on the Roger Bannister Track in Oxford, England in a time of 3:12. 3:12 was my finish time and I had a bit left at the end. Helene had done a monumental job pacing me and once again, for the 6th time, I fooled the clock and achieved my goal. Helene and her father were kind enough to come out on a gray Sunday morning to help me run the 800m. It's all about the start. Here I channel Aspen High School Track Coach James Aldridge as I "Bolt" from the blocks. If today had been a box of chocolates the prevailing flavor would be bittersweet. On this, the opening day of the Olympic Games, I went five for five in my quest to run the top ten running events “half as fast” as the standing world records, as I posted a 16.3 100m and a 34.33 200m. Each time would have to be regarded as personal bests, since I have run these events so rarely in life. I mean, when was the last time someone timed you in the 200m? While the times were fine, the real sweetness came from the warm welcome that was shown to me by the members of the ASV Berlin Athletics Club, which calls the Poststadion their home. With arms wide open, they hosted race2walk2016.com and made me feel like a visiting champion. It was the best example of the Olympic spirit possible. Sportsmen and women who saw someone with a goal and did everything in their power to insure that I had the best possible conditions to achieve that goal. If you have read my earlier posts, you’ll know that I had been denied in Deutschland. The staff at the Olympiastadion in Berlin, site of the 1936 Games that took place 80 years ago this week, determined that they “could not support” my project. This meant that this perfect storm, the Opening of the Olympics, the date anniversary of Jesse Owens third Gold Medal in 200m in ’36, the track where Usain Bolt set his world records in both races, and my dream of running in the shadow of it all to raise funds for the Bridging Bionics Foundation, went a waistin’. Bitter. Maybe we’ll try it again in another twenty years for the centenary anniversary. Fortunately, and totally inexplicably, I stumbled upon the Poststadion as a backup. And the serendipity made it all the sweeter. Here Club Trainers Droege and David give me grief about the slow 100m and 200m times that were recorded forever in the ASV Berlin Athletics Club official register. Oh, and the medal was awarded to me by the club. After a week of gray skies and a morning of pouring rain, the sun came out as Linda and I arrived at the track for the sprints. A small cadre of ASV club members were there to help me get to the finish. Helmut Böhm, an 83-year old former German sprinter, now down a leg but still filled with the spirit of a champion, came out to start the race. He brought his addidas spikes from the 1950s to show me. His wife Margaret, an athletics jurist brought her verification forms and records book to record the events in German track officialdom. Barbara Jensch, an eight time German Champion in the shot put, javelin (the “spear” she called it as she mimicked the throw), and the discus, and her son, Michael, organized the track. And Droege Holger, a club trainer, provided the appropriate translation and moved us all forward. It was an amazing display of support. And, at the end of the day, the gang gave me a medal in honor of race2walk2016.com. I look forward to sharing it with the folks from the Bridging Bionics Foundation on my return. Some of those who came out to the Poststadion in Berlin for the race2walk2016.com 100m and 200m runs. Now it is on to Oxford. The 800m is Sunday morning and I am nursing a sore hamstring from my 200m, but we shall give it a go. After all, life is like a box of chocolates. You never know what you’re gonna’ get. A photo of a photo that is on display at the Olympiastadion of a packed house during the 1936 Olympic Games. Look closely and you will see my sad shadow in the photo. It was eighty years ago this week that the Olympiastadion in Berlin hosted the 1936 Olympics, where Jesse Owens won four Gold Medals. It was seven years this month that the Olympiastadion in Berlin hosted the 2009 World Championships, where Usain Bolt broke the world records in the 100m and the 200m runs. And this year, unfortunately, the stadium will not be hosting my race2walk2016 attempt to run those two races “Half as Fast” as the world records. After a thorough review it was decided that they “could not support the project” at this time. While deeply disappointed, I appreciate the time the stadium invested in reviewing my request and wish to thank their staff, especially Matteo Canlis Wandel, for providing me with a proper explanation. I spent the day yesterday at the sprawling and magnificent Olympic complex and was awed by the unique combination of history and functionality that is the hallmark of the Olympiastadion. When you come to Berlin, it is a must stop. So it was, with hat in hand following the decision, that I set off in search of another venue to run on Friday, August 5th, the day that coincides with the Opening Ceremony of the 2016 Olympic Games in Rio. It is also the anniversary of Jesse Owens’ 3rd Gold Medal at the 1936 Games in the 200m. This is as close as I came to the Blue track in the beautiful Olympiastadion where Usain Bolt broke the World Records in the 100m and 200m in 2009. My first stop was the Poststadion in West Berlin, not far from the main train station, nor the former Berlin Wall. It is a handsome facility with a beautiful, fully sanctioned running track that appeared to be brand new. The stadium itself seats upwards of 12,000 people and was built in 1929 on the site of a former Prussian Uhlan military training site. It has historic bona fides, including a fight featuring Max Schmeling in 1935. During the 1936 Games the German football team was ousted by Norway 2-0 in a match that was viewed by Hitler. As I emerged from the dense trees that surrounded the field, I saw figures at the far end of the track and made a beeline in their direction. At a table sat one Barbara Jensch, a former eight-time German Champion in the Discus, Javelin and Shot Put. Next to her was a trainer named Holger Droge who, fortunately for me, spoke excellent English. I’m not sure what they thought of this 60-year old American with the crazy story about running races and being denied by the Olympiastadion, but they smiled and said, “You can run here!” The track is a perfect site and they have timers and starting blocks and, most importantly, an enthusiasm for the race2walk2016 project. “We have many international runners who come to the track,” they said as they explained about the importance of the recently renovated facility to the community. My new Haus: The Poststadion, home of the ASV Club. The stadium is the home of the ASV Club and is well known for supporting disabled and Paralympic athletes. It is, in short, a perfect venue for me to attempt both the 100m and 200m runs. I hope to come in faster than :19.1 in the 100m and :38.38 in the 200m. While neither time would impress Bob Costas, they are the times I need to achieve my goals. To undertake something like the running decathlon makes it obvious, I think, that I have a passion for running. As if running every day for more than five years did not already bear that out. But in Valbruna, Italy, I took a run with a man who makes my love affair with running seem like a teenage crush. Tadei Pivk (tadeipivk.com) is the 2015 Sky Runner Champion. And he is perhaps the most dedicated runner I have ever met. He runs marathons, and more, with extreme altitude changes that would humble even the most acclimated alpinists. On the day we ran he had already completed a “cross training” that included a bike ride that was the equivalent of riding up Independence Pass, back to Glenwood Springs and then back up the Pass before coming home. 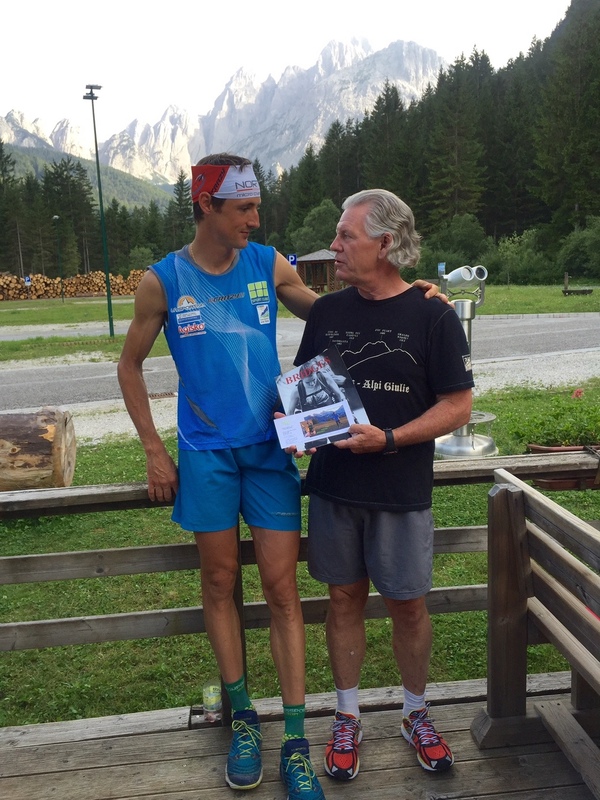 He was told about “The Running Decathlon” and generously agreed to come to a local hut, hear about the event and learn about our quest to raise funds for the Bridging Bionics Foundation. Though we had severe language issues, Tadei instantly grasped the importance of the Bionic Exoskeletons and had been aware of them after seeing a BBC documentary on suits that have been made in Japan. He also seemed impressed by “The Running Decathlon” concept, though Tadei could complete my entire quest in a single day, with considerably faster times than my entire year’s project. He is built like a cross between a Whippet and a Gazelle and his legs literally reached my chest. His style is so effortless that just watching him run brings both admiration and envy. The irony is that his Slavic name is pronounced “Today” and “Puke.” It makes for a plethora of puns. And yes, he got tired, not of running but of my jabbering in English. Running with Tadei got me thinking that part of the joy of running is that it can be so versatile for everyone. Some may love to run up-hill and on the tops of mountain ranges like Tadei, where others want to sprint on a track. Some like a regular low and slow jog, while others want to test themselves in 5Ks and 10Ks. Me, I like to chase history. That means three for three in Dutch, and I am elated to report that, this morning, I achieved my goal of running the 5000m half as fast, or in twice the time, as the current world record held by Kenenisa Bekele of 12:37.35. In fact, I ran it faster than half as fast, as I closed with a time of 24:14.97, nearly a full minute faster than I needed to be. Maybe I set my sights too slow. This is the third race in The Running Decathlon and I have completed all three, the Mile, the 1500, and now the 5000m, in times that shattered my original goals. I guess I am just teeing it all up to do once again when I am 70 instead of 60. Again, it was an amazing experience. Hengelo was a town I had never heard of before this endeavor and now it will forever be a part of me. “We are not known for our monuments or historical markers,” said Monique Otto from Bureau Hengelo, the promotional arm of this charming tech/industry city in the southeast corner of the Netherlands. But they have wonderful neighborhoods, a Michelin starred restaurant and a young vibrant student population that make it a pleasing visit off the beaten tourist path. And they also have the Fanny Blankers-Koen Stadion, a charming track and field-only facility that annually hosts the stars of the sport in an IAAF Meet that has seen some of the greatest performances by African distance runners in history. In 2004, Bekele, an Ethiopian, came here with a world record in mind and he ran so swiftly and so smoothly that his time has not been challenged since. The video of the run is spectacular (https://www.youtube.com/watch?v=QSSBtxvd5BI) and it shows the 22-year-old at the peak of his abilities. He is still the world record holder in the 5000m and the 10000m, perhaps the most competitively run races in the world. Think of that. With all of the 10Ks and 5Ks contested each week, each year, every single runner is behind Bekele. And, going into next week’s Olympics, the fastest 5K this year was run by Mo Farah of Great Britain, whose 12:59.29 is a more than :21 behind the time Bekele ran here in Hengelo. But enough about the greats. Back to me. I was very nervous going into this race this morning. Unlike the heat that was oppressive in Rome, the skies were overcast and the temperature was right around the 60-degree mark. I had a pacer, Lars Pluym, a decathlete who competes in the FBK Stadion, who showed up unannounced to help. There was a team of locals, many of whom were here at the Stadium the day Bekele broke the record twelve years ago, including Bennie Oude Engerink (starter), Marion Witvoet (timer), Geert Linde (equipment), Bennie Horstman (equipment), Aiko Staudt (manger), and Roelof de Vries, the coordinator of MPM Athletics Union, all of whom are now official members of the Bridging Bionics Foundation support team. I also had the spirit of Tim Burr, who has not only been an inspiration for this entire undertaking, but who also contributed a post yesterday that put things in perspective as I dealt with a silly missed train connection. I thank all. Hartelijk Bedankt. Now it is on to Berlin and the Sprints. Tim Burr is a client of the Bridging Bionics Foundation. A great skier, he suffered an SCI while skiing in November of 2014. He was kind enough to pen the following for this blog. Word or short quote that defines you: If you’re not going hard, you’re not going anywhere! A spinal cord injury affects a person every day of their life in the same way it affects and controls every part of the body. People with spinal cord injuries and paralysis deserve no more pity or empathy than any other person. I say that because I firmly believe that everybody's life is hard, and equally as hard as anyone else's. Part of life is the action that you take to maneuver through obstructions, tragedies, miracles, and phenomena that every being is subjected to. However there is a difference in perspective that potentially only someone who is injured or spinal cord impaired can visualize. It is the perspective of immobility. Watching life passing by while seated is something very special indeed. There are simple missed opportunities that being wheelchair-bound excludes you from that are more obscure than the inability to climb stairs or hike a mountain. I have found it extremely and exponentially aggravating that when I meet someone new, I have lost the opportunity to stand from my seat, lock eye contact, and firmly shake their hand. No longer do I have the opportunity to throw my arms around friends and family shoulders for a photo. When I'm walking in public strangers no longer see a young, tall, athletic guy I once portrayed. Being in a wheelchair really makes you appreciate these things that we once took for granted. Bridging Bionics does these things to make them attainable yet again. Bridging Bionics is the action we take to work against our injury. I visit the Eksoskeleton "Tucker" weekly so that, even for one hour, I get to see the world from my true elevation. For that hour my eyes are 6 feet off the ground, and my perspective of the world is exactly as I remember it. As I've been told by my wiser friends that roll in chairs, after SCI (spinal cord injury) there must be a balance between getting on with life in your present situation, rehabilitating to improve your present situation, and preparing for your future situation. Getting back to life in a wheelchair can be as fun as you make it. Now you have killer parking, your shoes never wear out, you'll never have flabby arms, and you'll always win musical chairs. Life goes on and the world is mostly accessible so you can still enjoy life. As with any injury, rehab is of the utmost importance, however with an SCI, rehabbing becomes a constant in your life. After your initial injury you can start to rebuild strength and start adapting to life in a chair but as you get farther from that injury, secondary complications and preventative exercise become more of your focus. After breaking my neck, exercise takes about as much time as a part-time job. My weekly schedule for the better part of the past year has been: Monday – weight training. Tuesday – practice pushing my chair and maneuvering through public spaces. Wednesday – myofascial release and bodywork. Thursday – weight training. Friday – stand upright, do a lower body work out on the Galileo vibration table and walk in the robot (or bionic exoskeleton suit). This schedule paired with a decent diet and amazing support has kept me from having to deal with skin ulcers, UTIs (urinary tract infections), joint contractures, blood clots, low blood pressure, shoulder injuries, and many other secondary complications that seem almost unavoidable after spinal cord injury. But that's not even mentioning the advantages and upgrades, in quality of life, that this rigorous schedule has given me. There's also the preparation that is needed for what may come in the future. We prepare so that when we are given the opportunity to rise from these chairs, we will be healthy enough, strong enough, and fully equipped to do so. We work for bone density and blood pressure. We work for healthy joints and flexibility. The stagnation that comes with immobility does not apply to us. The Ekso made available to us by the Bridging Bionics Foundation when paired with extensive exercise, and a positive outlook can bridge the gap from immobility to mobility. Three weeks down and two to go in this summer’s races to complete The Running Decathlon in my 60th year. This week, the scene changes from Italy to the Netherlands, where on Friday, August 29, at 9:00am in the Fanny Blankers-Koen Stadion in Hengelo, Netherlands, I will attempt to run the 5000m in twice the time – or half as fast – as the standing world record of 12:35.37. The record was set on my sister Sudie’s birthday, May 31st 2004, by the great Ethiopian distance runner Kenenisa Bekele, the current world record holder in both the the 5000m and the 10000m. Bekele runs the curve. He is the record holder in 5000m and 10000m. This distance presents a new challenge for me and I am looking forward to running it on the track that was named after the great Dutch Olympian. In 1948, Fanny Blankers-Koen, a mother of two, won not one, not two, not three, but four Olympic Gold Medals in the London Summer Games. Her legacy is amongst the greatest in all of track and field history. I will have more on this event this week, as we get closer to Hengelo. The following week calls for me to attempt a 100m and 200m double in the same day. On August 5, in Berlin, I will run both of those races in an attempt to run half as fast, or twice the time, of Usain St. Leo Bolt’s marks of 9.58 and 19.19 that he put up in 2009 at the World Championships. We are having a few challenges currently in gaining admission to the Olympic Stadium in Berlin on that date, but we shall persevere and keep you all posted. Then the final race of the summer tour will take place, but not in London’s Olympic Stadium as I had hoped. The pending start of home side, the West Ham United Football Club has resulted in the stadium removing the track. So instead, I will head to Oxford, England, and run the 800m on the Roger Bannister Track. I think this is an excellent alternative. It is the site where Roger Bannister ran the first four-minute mile in history. Again, more on that race as we move forward. This leaves the 400m in Seville, 10000m in Brussels, the Half Marathon in Lisbon and the Marathon in Berlin for next spring, when I plan to return and complete The Running Decathlon. Fanny Blankers- Koen won four Gold Medals in London in 1948. The stadium in Hengelo, Netherlands is named in her honor. Guards await the screening of the crowds at the Vatican. So a prevailing theme of the trip has been the horror of world events. In the three weeks since we left Colorado, there have been attacks in Dallas and Baton Rouge and, here in Europe, in Nice, Bavaria and most recently, Munich. There was also news of the attempted coup in Turkey and, of course, war and bombings continue throughout the Middle East and in Kabul. We have received emails from a number of people asking if we are worried about our travels. We are periodically concerned, but worried? Should we not go to Berlin because of terror in Munich? Should we stay away from Brussels or Amsterdam or London? Of course, the answer is no. There is trauma around the globe, but we cannot change our lives and bend in the face of the fear that has been fomented. To cancel a trip to Germany because of these events would be like me saying I will not go to Dallas for Sunday Night Football because of what has happened there. Having said that, there have clearly been signs throughout our journey in Italy that things are on higher alert. A sign of the times, though they have been there for a long while, are the checkpoints at the front of Vatican Square. As I ran by St. Peter’s one morning last week, I could see soldiers and security out in front getting ready to check people as they passed. And in Trieste, there were armed military guards on the dock in front of the giant cruise ships checking everyone who came and went. This is just the way it is these days. We shall be vigilant, but unbending. The mountains of the Julian Alps have been very kind to me. This week, Marco Tonazzi put me together for a run with Five-Time Olympian, yes, that is right – Five Time Olympian – Gabriella Paruzzi, who was a member of the Italian team for each Olympics from Albertville in 1992 through the Games in Nagano in 2006. We talked about how she has sadness and mixed feelings about the ban on the Russian team for the upcoming Games in Rio. In her own experience, Gabriella has seen the unfairness of those who have cheated in athletics. Her Gold came after the banning of a Russian who had doped. Gabriella feels that it is necessary to deal harshly with those who cheat, but it is unfortunate to have others who did not get caught in the web of the ban. In Gabriella’s Gold Medal race, she lost a pole during the competition. Her coach gave her another pole, but it was too long. She lost ground to the leaders, but eventually was able to get a ski pole that was the proper size. Though trailing, she increased her effort, reached down deep and picked up the pace, and then raced past the other skiers to win the Gold Medal. Gabriella knows what it is like to be challenged. Kelly and Gabriella look at the map of the cross country ski trails in the Valley. It was an honor to share the trail with her. In 2002, she won the Gold Medal in the 30Km Classical cross-country skiing event in Salt Lake City, Utah. She also won four other bronze medals, one in each of the other Games, as a member of the women’s 4x5km cross-country relay team. Today, she and her husband run a restaurant in the resort of Lussari high in the Julian Alps. She is also a supporter of other Italian athletes and works with the Italian Army on athletic endeavors. Marco had mentioned “The Running Decathlon” and my quest to raise funds for the Bridging Bionics Foundation. Gabriella eagerly agreed to take a run with me to show her solidarity for the project. We met on a majestic Sunday morning in the Saisera Valley. I took her through the entire program and explained the importance of the goal of purchasing a Bionic Exoskeleton for the Foundation. She was touched by the stories of Amanda, Mackenzie and Tim,, and could relate to those who have overcome challenges in their lives as well. She explained that she had worked with Italian athletes who had been disabled by injury, but had come back to ski in the Paralympic Games. Gabriella and I took off on a short but energetic jaunt through the trails of the Valley that she runs today on a regular basis. So the past week has been consumed with consuming the amazing foods and wines of Friuli. This is a region of Italy where few Americans visit and we have heard little English since we left Valbruna on Monday. Still trying to train between bites of prosciutto and fresh local cheese, and the great Friulian wines. Have had some epic vineyard runs, as well as a heated jaunt on the coast in the city of Trieste. Staying at the Hotel Victoria, which was once the home of the great Irish author James Joyce, who spent much of his time loving the food, wines, and especially the coffee for which the city (the home of Illy) is famous. Best run of the week, however, was a test/training run for the 5000m, or 5K, which I will run next week in Hengelo in the Netherlands. Had, as my training partner, Vail’s beloved Marco Tonazzi, the former Italian World Cup ski racer who was on the Italian team with Alberto Tomba. Originally from the picture-perfect mountain town of Valbuna, Marco now lives in Eagle, and owns the fabulous Valbruna clothing store in Vail. When he’s not pace setting for me, he runs the Valbruna Inn, which he also owns and where we were fortunate enough to have stayed for a bit. Anyway, twelve knee procedures later, Marco is still in fine form, biking the steepest hills and very occasionally running with his guests. He took me to fine track in the area, where I got in a smooth 12-and-a-half laps. Exactly the distance of the 5000m. I won’t tell you the time. But I am looking forward to Hengelo. The folks who make the AETHER clothing that I am fortunate enough to be wearing on my European running adventure are globetrotters themselves. Read their posts on the aetherapparel.com site or the extraordinary AETHER journal, where they detail their 52 Hike Challenge and their moto trips through the Canyons of Malibu (one of which I grew up in). There you can get a feel for the spirit of adventure that is their driving ethos. That noted, I believe I am correct in saying that AETHER clothes had never before been on the track in the Stadio Olimpico in Rome until I wore them on my Mile and 1500m runs this month as part of The Running Decathlon. This is the stadium that hosted the 1960 Olympic Games, which featured such stars as Cassius Clay, Wilma Rudolph and Rafer Johnson. It is the place that goes absolutely crazy when the AS Roma and Lazio Football Clubs take the turf. And it is one of Europe’s epic stadiums. On the day of my run, the only logo in the pristine Stadio Olimpico was the subtle “A” on the back of my AETHER shirt. I’m convinced that whatever success I had in Rome was predicated on the training I had done at elevation. So, with pleasure, I arrived in Valbruna, Italy, which, while nowhere near as high as my home in Aspen, does provide an extra hit of altitude for my daily runs. And besides, it is drop dead gorgeous. Some of you may recognize the name Valbruna from the clothing shop in downtown Vail that specializes in the very best of Italian alpine and ski attire. There was once a Valbruna in Aspen, as well, in the space where the North Face is now. The stores are the creation of former Italian World Cup ski racer, Marco Tonazzi, who grew up skiing in this, the actual Valbruna, an impossibly beautiful town in the Julian Alps of Friuli Venezia Giulia region of Northern Italy, about two hours drive north of Venice.Here the mountains jut straight out of the riverbeds and reach into the sky like fingers of stone. The villages are a mix of Italians, Austrians and Slavs, as the three countries come together near here like the Four Corners of Colorado join the states ?? Marco lives in Vail, but also operates a hotel in Valbruna called The Valbruna Inn. It is amongst the most agreeable places I have ever set foot in. The rooms are pitch perfect with regional and local art and furnishings, and the views are so stunning as to seem fantastical. There is a restaurant that specializes in the regional cuisine, and the Friulian cuisine is as good as it gets. A library downstairs features an extraordinary selection of first edition books on climbing, with a first edition of Edmund Hillary’s personally written tome on climbing Everest that is, get this, signed by Hillary himself. In Rome, I ran in the footsteps of Hicham El Guerouj. But here, in the Julian Alps, I am trekking in the footsteps of a man I had never heard of before, Dr. Julius Kugy. Kugy was a botanist and alpinist who lived in Friuli a hundred years ago and made the vast number of first ascent climbs of these craggy peaks. He is also well known throughout climbing circles for his conquests of the most important faces in the Alps. And he was a philosopher. All over Valbruna and the region there are wooden signs with “Kugy-isms,” as I call them, carved into them. "And thus you, the long sought and passionately desired miraculous flower of my heart, will rise some time from the dreams of my yearning, from the strength of my trust, from the mysterious gloom of your origin, of your blossoming and vanishing, and you will come and join me in the late evening of my life. Silent and modest, soft and smooth is your sunny figure, your tiny calix has a silvery gleam, the shining white garment of petals is embroidered with golden anthers, you are immersed in a transparent mist of far-off longing, encircled with an aureole of poetry, myth and romance. It will be in this form that you, the little princess from fairy land, will be looking at me from your new castle high above the foaming young Soca. In your heavenly reality. Scabiosa Trenta! Never did my belief in you die, though you seemed to be beyond my reach. And though you were far away, I have never been unfaithful to you. I have been on the lookout for you all my life, anxiously listening to any news about you. I have been repaid for my love by the great, beautiful, good, eternal mountain." That was the comment made by my pacer, or “Rabbit, ” Mattia Barbaro (yes, like the Kentucky Derby winner), after we finished the 1500m in a time of 6:24.34, or 27.66 seconds faster than I needed to be “Half as Fast” as Hicham El Guerrouj’s world record. He was not talking about my running, of course, but he had “seen your video and website and what you do is very, very good.” Yes, he had been to race2walk2106.com and had instantly gotten the point. That what we are doing is running so that others can walk. Grazie mille, Mattia! The run today made me an astounding two for two in my quest to finish The Running Decathlon in twice the time as the world records. Frankly I am a bit shocked. My friend and running mentor, Jamie Monroe, swears it is the shoes and he may be right. Running in spikes on a fast track may well be what the difference is. And I also think training at altitude has helped. And there may be inspiration that emanates from the “cause,” perhaps a little Bridging Bionics Foundation karma that blows an extra shot of wind beneath my tired wings. Whatever, and it’s likely a combination of all of the above, I came to Rome and achieved, no obliterated, my goals on two successive Thursday mornings. There actually may be something to this. Today was slightly cooler as I headed to the track at the Stadio Olimpico. Due to the good graces of Ricki and John McHugh, the morning began in upscale luxury at the 5-star, hip and modern Palazzo Dama, which is not far from the Stadium on the banks of the Tiber. The short taxi trip to the stadium was a blessing because, once again, I was very nervous about the run. Once inside the Stadio Olimpico, though, I felt like I was home. After all, I had run on this adopted home track just last week when I ran my 7:05.76 mile. I just love having an official starter who fires a pistol and a timer who can get an official time to the hundredth of a second. This was eighteen years to the day since El Guerrouj had shattered the 1500m mark with a run of 3:26.0 in the Golden Gala. It is the longest standing of The Running Decathlon world records and if you watch the You Tube video, you’ll see why. He just crushes it, running each lap in less than 50 seconds, and all alone in the final lap. It is a beautiful thing, no? Next up is a trip to Friuli to discover some new wines and do some training for the next challenge, the 5000m. Your donations and support have been truly inspiring. So there are so many things to say as I write this in Rome the night before I try and run a Metric Mile, 1500 meters, in 6:50 or less to complete my “Half as Fast” double. Like, I’m nervous. Like I’m excited. Like the second race suddenly seems more imposing than the first. It is so interesting that I have that feeling in the pit of my stomach that in the morning I have a race to complete. Not normal for me. But great. Also great is all of the support that has come our way in the last week since the Mile Run in the Stadio Olimpico. Donations, travel help and just general words of encouragement. It has been humbling and, fortunately, we are well on our way to reaching the goal to purchase a Bionic Suit for the Bridging Bionics Foundation. But I thought I would use these last few moments before I slumber to pay homage to Todd Rundgren, my Lord and personal savior who has not only provided the soundtrack to my life but has as also provided the soundtrack to my training. Long runs and short ones all powered by Todd. Unless you are a devotee you probably know songs like “We gotta get you a woman or “Hello It’s Me” but there is so, so, so much more to the Todd collection than just the hits. For an amazing example of a portrait of an “Artist as a Mature Man” simply tune into the Todd performance in Amsterdam with The Metropole Orchestra on You Tube. His pre-intermission performance of “Second Wind” is as inspiring as watching the young Italian Pietro Mennea running a world record in the 200m in 1979. And believe me I have watched and been inspired by both this very evening.